The Lord of the Strings | Ply, you fools! There’s something about grandmothers and cooking: they just don’t know when to stop. In my family, we have a running joke about my grandmother. Every time there’s a family dinner, she’ll cook as many dishes as there are people, and then cook some more. And after the meal, when we’re all slouched in our chairs round and bloated after eating our own body weight, she will start to explain how really, when you think about it, she didn’t make that much. In fact, it was less of a meal and more of a “light snack.” “You see,” she’ll say, “I really only made the pot roast and the salad. But then I had leftover spinach from the salad, so of course I had to use it to make lasagna. And then I had leftover tomato sauce from the lasagna, so the only logical thing to do was to bake okra in it. And then there was the leftover basil…” But by this point we have already slipped into a food-induced coma. I work part-time at a hippy-dippy vegan falafel restaurant that is also preoccupied with leftovers. It’s a cute little out-of-the-way place with delicious food and a huge following, and it prides itself on its no-waste policy. We scrape containers clean, we compost all our waste, and best of all, at the end of the day any leftover food is jarred and sold at a loss so it will be consumed. Needless to say, I’ve accumulated quite a collection of jars in my time there. What’s a girl to do with all those jars? Dress them up, of course. I know I said I wouldn’t start anything new until Matt’s sweater is finished, but stashbusting doesn’t count. A couple of years ago, I knit this colourful sweater, and ended up with a ton of leftover yarn. 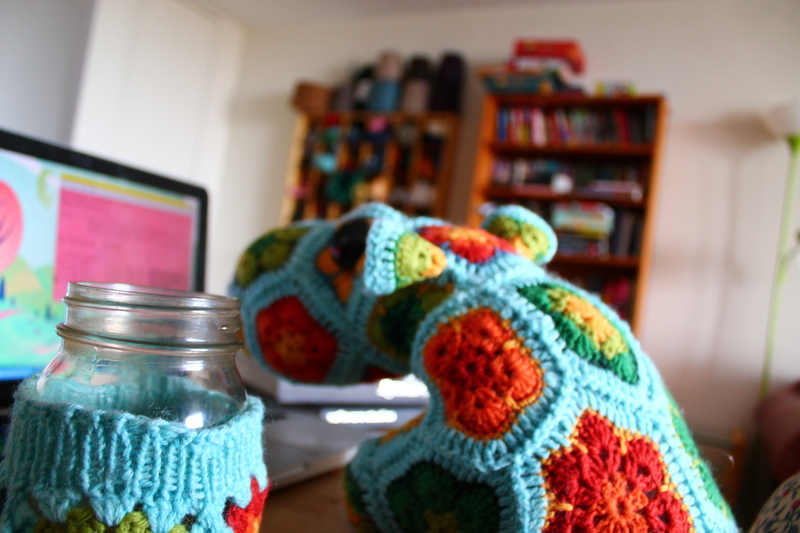 “No problem!” I thought, and crocheted a hippopotamus.With the leftover yarn from the hippopotamus, I made a jar cozy.With the yarn leftover from the jar cozy I’m going to make… wait a minute. I am truly my grandmother’s child. Happy the Hippo sure likes having a mug that brings out his skin tone, though. Of course Happy’s desktop would look like this. I’ve been thinking a lot about leftovers lately because I’m planning a big move across the country for my grad studies, and I can’t bring my yarn with me. I’ll post about that soon (it’s taking up about 99% of my brainpower and energy at the moment), but for now, the only solution is to knit everything, right away. Stashbusting, here I come! What do you like to do with leftover yarn? Do you throw it away, keep it indefinitely, or do you have any go-to stashbusting projects? It’s been three long months since December, when I first cast on the sweater I now call in my private thoughts “The Pullover of Despair”. That’s three months of slow, dark days, where knitting a rows of 22 cable patterns felt like a mile-long trek through a snowdrift. In those three months, more slippery alpaca stitches slipped than old ladies in an ice storm. 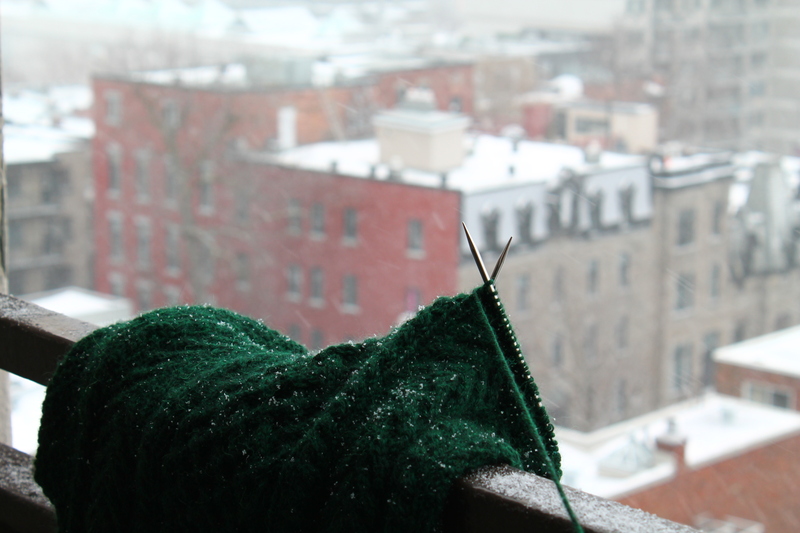 There were days when I didn’t want to put down my knitting even to go to the bathroom, because picking it up again meant puzzling out exactly what row I had been working on before, and took more time than slipping in and out of a snowsuit, tuque, sorels, long johns and three pairs of mitts. Then March hit, and all of a sudden, a shaft of light broke through the clouds. The pattern had pronounced the dreaded words “work in pattern for 14 inches,” but suddenly those 14 inches seemed to be melting away. Thoughts of new projects were already budding and blossoming. “I’m getting near the end,” I thought. Wouldn’t it be nice if, one day, I was right? Now is the winter of my discontent. 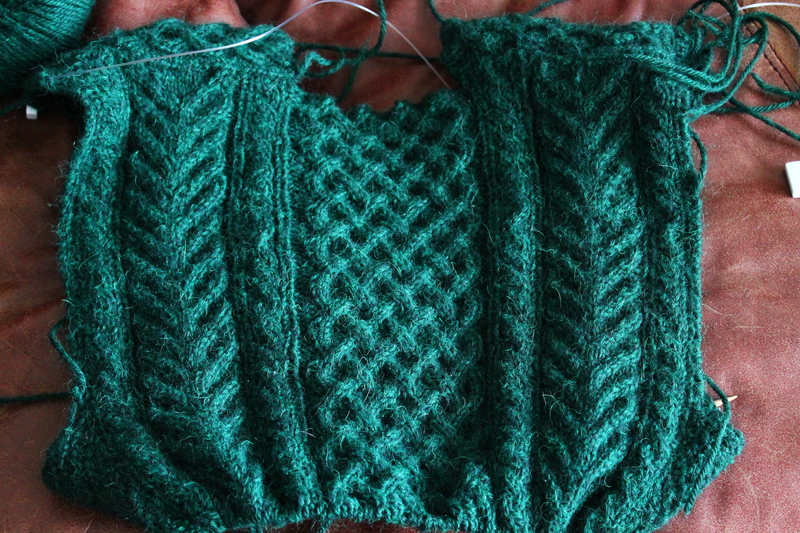 Only two inches left to go until the ribbing, and it feels like I’m not making any progress. I’m spending at least half my time finding and fixing mistakes… and the other half? I’m making them. And then reality hits like a snowball in the face. Two endless inches to go, and twelve inches of snow on the ground, and you know what? Summer doesn’t feel any closer. If you see any miscrossed cables, please don’t tell me. 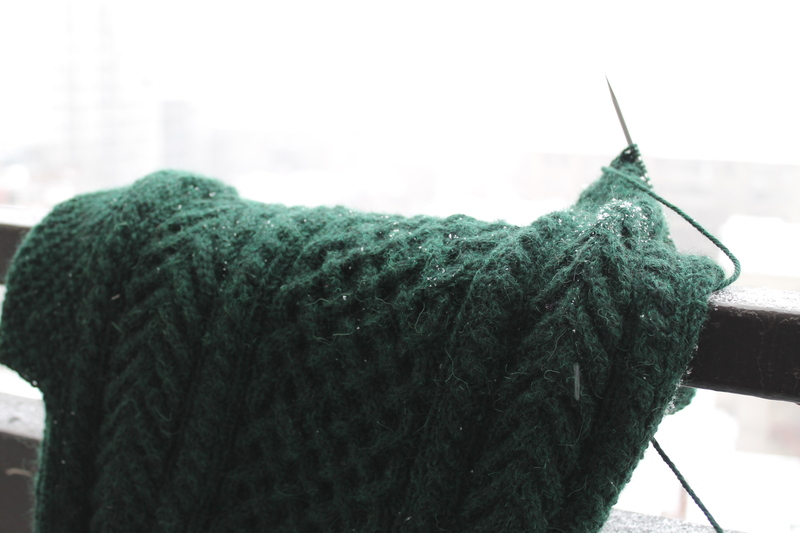 What do you do when you get the winter/knitting doldrums? …like a fuzzy cabled tankini. The alpaca is so slippery that I’ve been spending more time fishing for dropped stitches than knitting. I feel like I’m inching along on this sweater. Actually, scratch that. I wish I was inching. I’m millimetring. Don’t get me wrong. I assured Matt before I started that I loved him 3.75mm needles’ worth, and I do. I’m going to finish this sweater… eventually. But that didn’t stop me from feeling a rush of relief when said 3.75mm needles snapped and I had to put the project on temporary hiatus. Oh, freedom! Unshackled from the chains that bind! 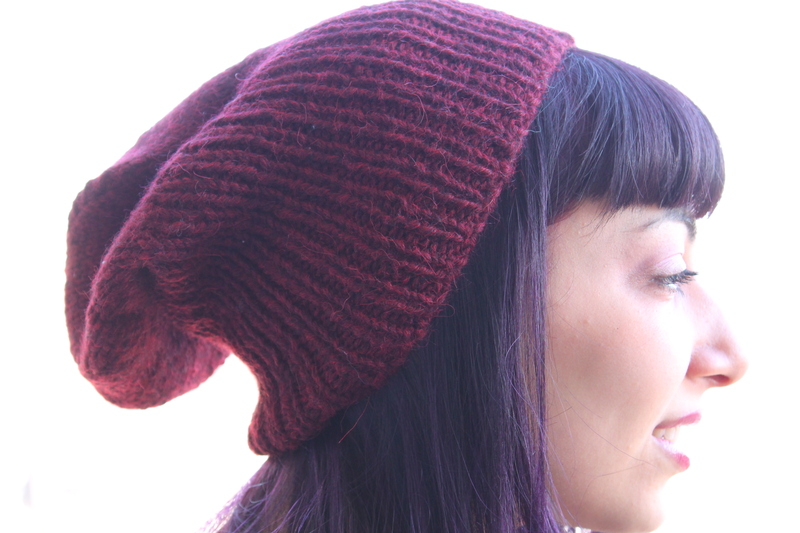 I needed a quick and easy project, and I found one: Thrifter Beanie knit in Andean Treasure held doubled. 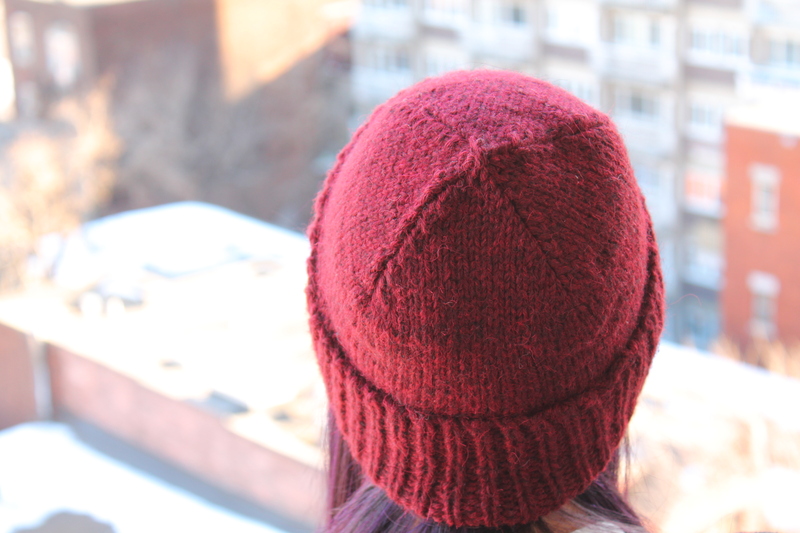 Two days of blissfully simple knitting followed, and a cute chunky hat was the result. 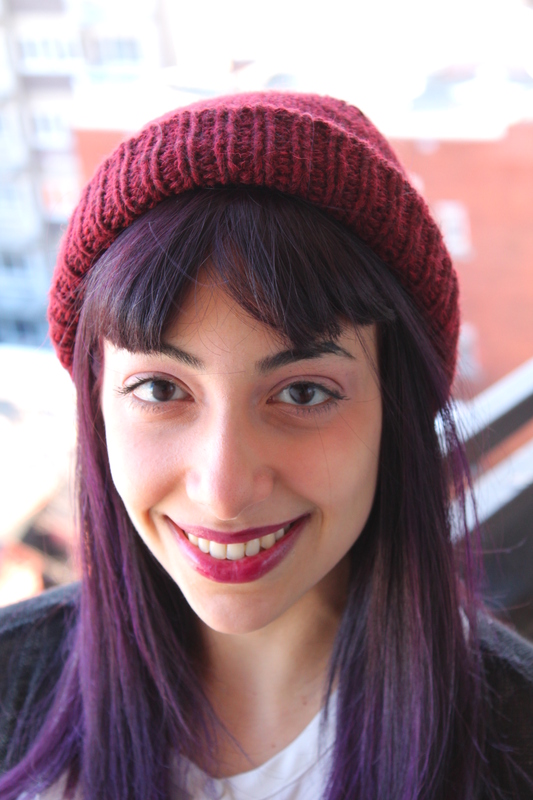 I like this hat because you can wear the brim 3 different ways for 3 different looks. and my favourite, folded 3 times for a Jacques Cousteau look! It feels good to wear an actual finished object. I picked up new needles for Matt’s sweater yesterday, so I’ll be back to my regularly scheduled knitting soon. Back to tracking five different stitch patterns with different row counts. Back to dreaming that I am lost in a jungle of tangled fuzzy cables. But I’ll always remember this one short weekend of freedom. 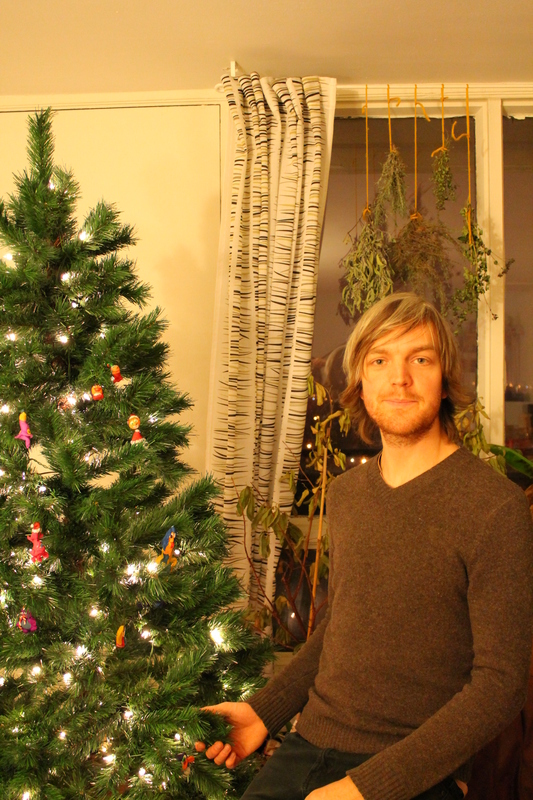 On December 9, I wrote a blog post about the the knitting I had to finish before Christmas. “No worries!” I was thinking. “I have a whole 16 days until December 25th,” and I envisioned those days stretching out before me like the vast plains of the Sahara desert–nothing to do but knit at my own pace, pausing perhaps to munch a bonbon or take a sip of tea. Oh, how wrong I was! 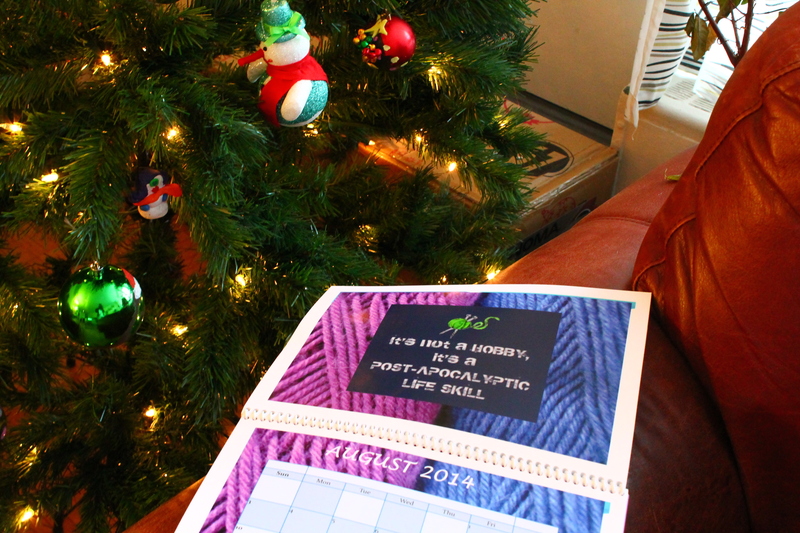 I had forgotten a vital fact: I was knitting for friends, and I wouldn’t see my friends on the 25th. In fact, I was going to see them for the last time before Christmas on the 19th. And I had an exam that same morning. What was a knitter to do? Pre-Christmas stress completely overpowered pre-exam stress. 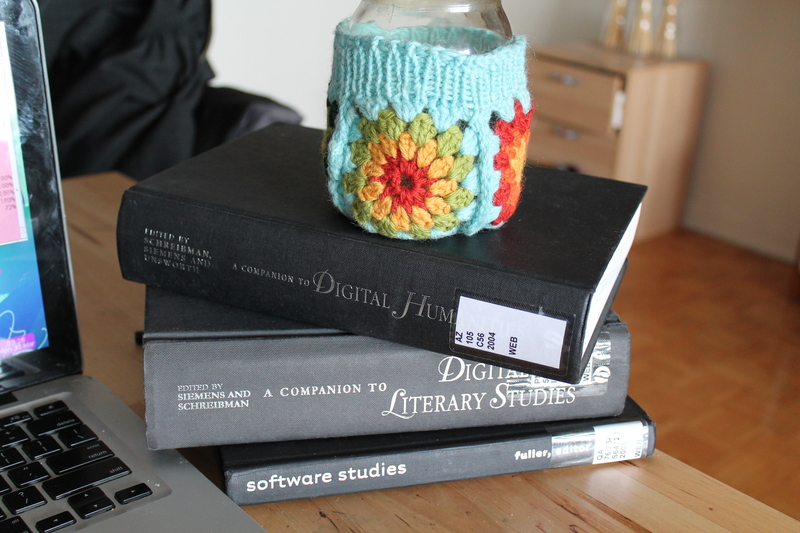 I shoved my textbooks aside; I forgot about the words “GPA”; I grabbed my yarn, and for 24 hours, I was a blurred ball of flying needles, snipped ends, and steam from blocking. Our little apartment became a sweatshop with a single worker. I tell ya, I feel for the elves in Santa’s Workshop. And was it worth it? Did I make it? My first time putting presents under my own Christmas tree! My two wonderful friends came over for a day of Christmas cheer. We decorated ornaments, watched Christmas movies, went shopping, drank eggnog, and generally had the perfect Christmas day. And we all, without planning it, gave each other handmade gifts. A hot water bottle with hand-sewn cover made by Sarah. I don’t know how I managed to live without one of these. I feel all warm and fuzzy every time I think about these incredibly thoughtful gifts, and I’m really, really glad I managed to finish mine on time. For Vicky, polar bear mitts. For Sarah, knitted tabby cats on store-bought slippers. They’re not quite perfect: I wanted to knit little scarves for the polar bears on Vicky’s mittens, and I didn’t manage to finish the back paws for Sarah’s tabby (to give you an idea of what a crazed state I was in on the 18th, I told Matt that giving the tabby hind legs was im-paw-ssible, and I needed to take a pawse, and I laughed for about thirty minutes while he stared at me rock-faced). But who’s going to notice? Our Christmas celebration was perfect. I’m so glad that I decided to knit my friends gifts. They are the kindest, most wonderful people on the planet, and they deserve an infinite number of knitted things. I know Christmas miracles are usually reserved for big things, like Scrooges and sick Timmys, or grinches hearts growing right when the Whoos need it most. But I’m having an incredible Christmas. I finished my knitting on time. I aced my exam. And most importantly, everyone around me, from my family to my friends to strangers, has been so kind and wonderful. Everything seems to be working out perfectly, and you know what? It’s not the stuff movies are made of, but it really does feel like a miracle to me. How long until something becomes a Christmas tradition? I’m a sucker for holiday traditions. In my family, we have a tradition that every New Year we throw sprigs of parsley at each other, and until I was a teenager I was convinced that this was a real tradition that everyone did. Luckily, I never brought parsley to any non-family events. That would have been awkward. Last year, when Matt and I were coming up to our first Christmas living together, we decided to start a holiday tradition. 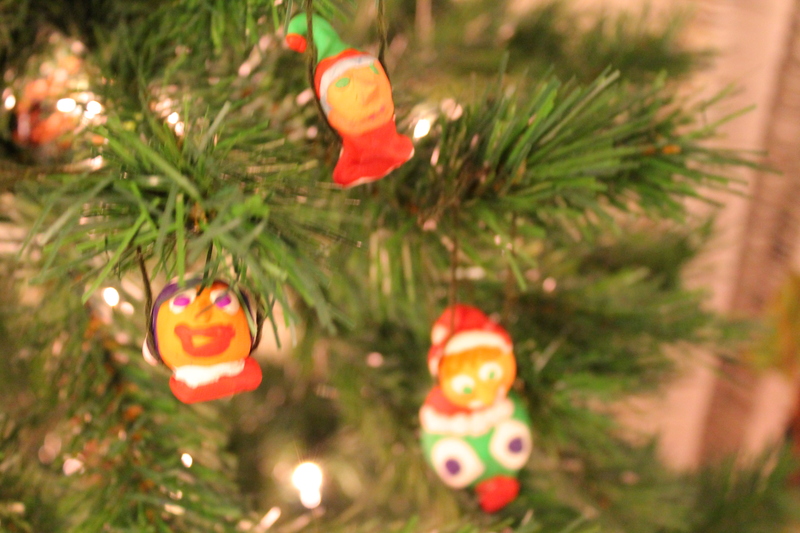 We didn’t have a tree yet, but we decided that when we got one, we would only cover it with handmade ornaments. Every year, we would have our friends over to make decorations, and our tree would get brighter and more full of memories as time went on. 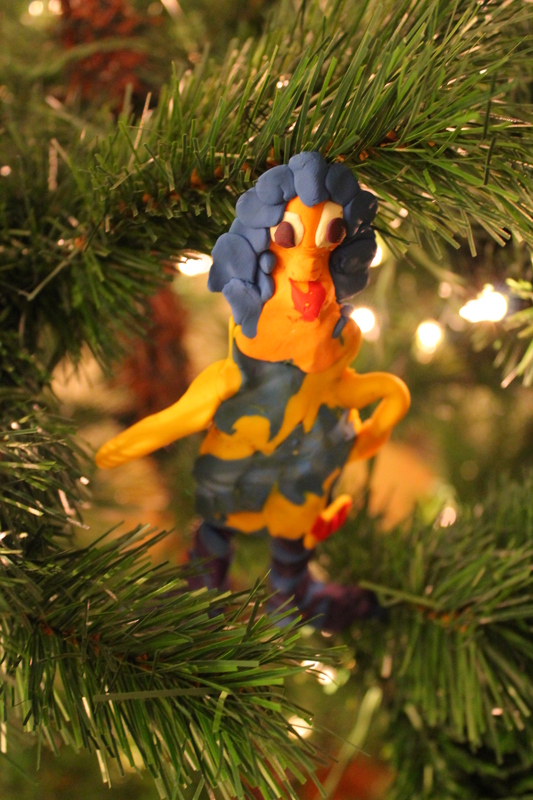 So last year, on Christmas eve, we bought a family pack of Fimo and invited some friends over for dinner, wine and a night of Christmas crafting. At the end of the night, I packed all the ornaments away in a shoebox. A couple of days ago, Matt and I bought a tree, set it up, and opened the shoebox for the first time since last December. …and some are downright terrifying. 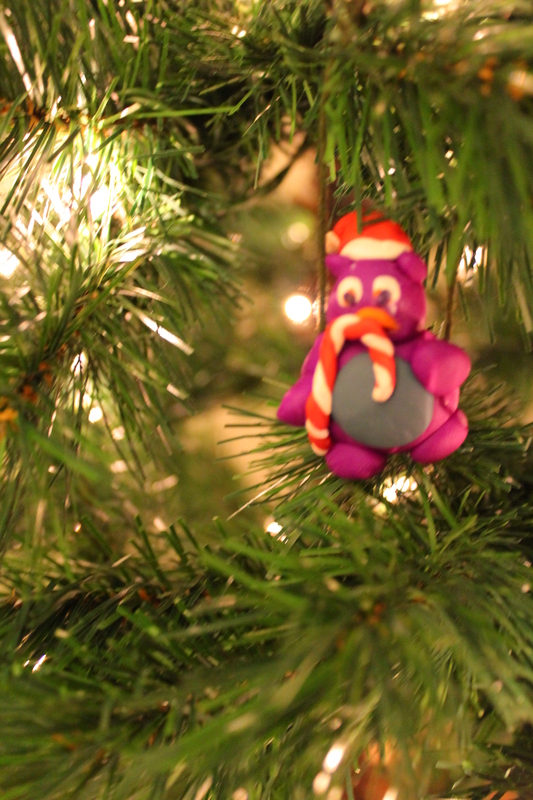 I already bought a ton of dollar store ornaments for us to decorate next week. I can’t wait until our tree gets a little fuller. 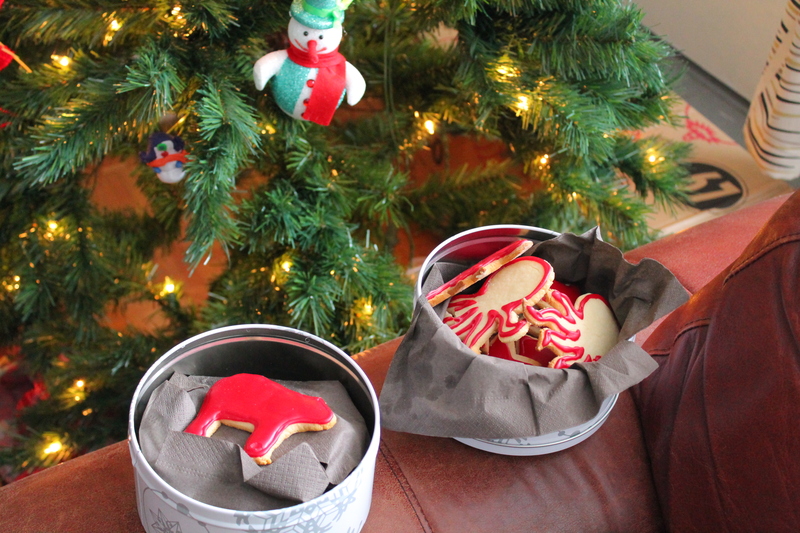 There’s something about Christmas that makes me feel all warm and fuzzy and gooey inside. I’ve been dating Matt for a while now, and most of the time, I don’t think too much about the future and where it will bring us. But there’s something about the holidays that makes time seem to stretch out before me, so that I can picture the years ahead as a series of snapshots in front of the Christmas tree, us getting older and wrinklier and smilier every year, our little family of two getting bigger and bigger, and our tree bowing under the weight of years’ worth of lovingly made ornaments. My Christmas knitting is in full swing, but since the person I’m knitting for might potentially read my blog, I can’t give away any details. So I came up with this Mad Lib instead. If you do it, leave me a comment to show me what you came up with! I’m working on a _______[noun] right now as part of my Christmas knitting, and I just cast off the first _________[noun]. It is ______[adjective]! The yarn I used, _____________[brand name] ________[animal], is absolutely stunning in the colourway _________[adjective] __________[noun]. 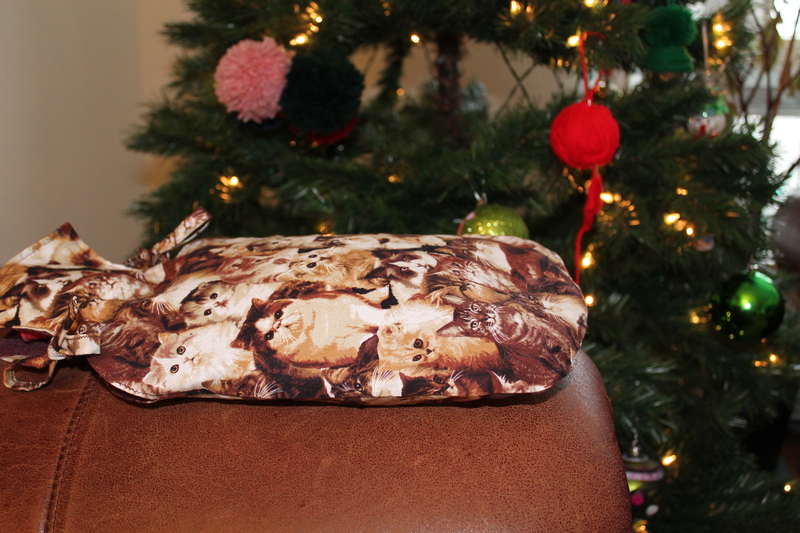 And the pattern I’m using, __________ [noun] __________[plural noun] by __________ [person’s name], is exactly what I _________ [verb, past tense] when I imagined the perfect gift for _________ [person’s name]! All in all, I feel that this gift will be a great ____________ [noun] and I wish I could ______________ [verb] one for myself too! Edit: I tested this out on Matt, and here’s what he came up with! The ridiculously warm and soft and squishy tree. I’m working on a axolotl right now as part of my Christmas knitting, and I just cast off the first hippopotamus. It is blue! The yarn I used, Wal-Mart Bear, is absolutely stunning in the colourway Fuzzy Tea Cosy. And the pattern I’m using, Cockroach Coffees by Keanu Reeves, is exactly what I destroyed when I imagined the perfect gift for Deirdre! All in all, I feel that this gift will be a great peanut butter and I wish I could sleep one for myself too! Look at the date. That’s right, look at it there in the upper left hand corner of this post. Today is Monday, December 9th. I just finished a whirlwind of assignments, I have a final tomorrow, and I am about 10% done my Christmas knitting. “What did you just say?” my past self asks. “Christmas knitting?” My past self is horrified because two short weeks ago, I was absolutely firm and resolute that this year, there would be no Christmas knitting. 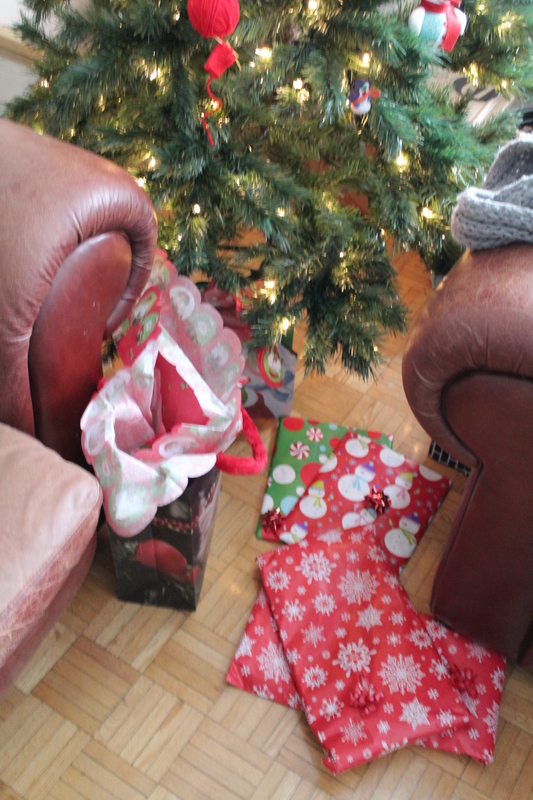 See, two weeks ago, my past self was convinced that she was getting storebought gifts for everyone. She had made a list, she had checked it twice, and there was nary a yarny thing on it. She was resolute. 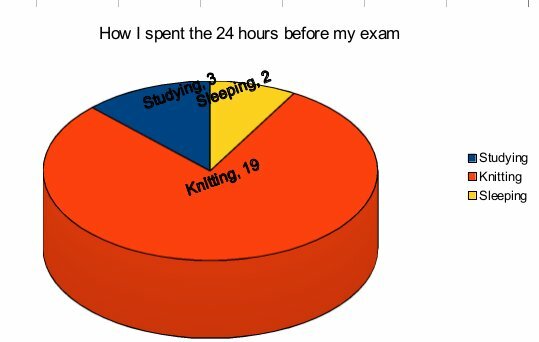 “I have finals until late December and hardly any knitting time, not to mention that I don’t have the budget to buy more yarn this year. And anyway,” she thought to herself, “I’m a selfish knitter. 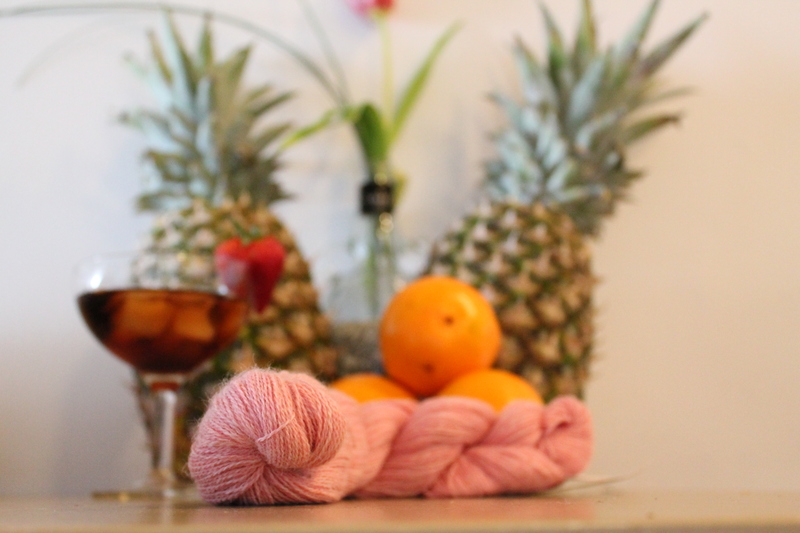 What’s the point of putting time into projects that non-knitters can’t appreciate? Oh, past self, so young and naive. You know nothing of the wisdom of experience the senility of old age THE KNIT PICKS CYBER MONDAY SALE. I couldn’t help it. The Knit Picks Cyber Monday Sale: the most celebrated day of the year, the day we take the time to reflect and ask ourselves, have we filled our lives with the most important thing: yarn? And looking at all that gorgeous, affordable yarn, I came to a conclusion. It’s true. I have the most wonderful, appreciative friends and family– and if I could cover them all in warm handknit fuzzy things from head to toe, it still wouldn’t be enough. But, I’m not crazy. (Well, at least I’m as sane as anyone who has conversations with her past self can be.) I’m not knitting gifts for everyone who deserves it. I’m knitting two. Two small gifts, and two weeks to do it in. I can make it–right? But I think I’ll let my future self answer that.